After visiting fancier burger bars during the last couple of weeks, this burger tour brought us back to a more down to earth place - Astroburger on Melrose Avenue. A popular lunch place for the employees of adjacent Paramount Studios, Astroburger offers an impressive variety of Sandwiches, Salads, Greek food and deserts. But that's not what we came for; we came for their famous burgers. The formation of this week's burger tour group was special, first of all we had a couple of new people joining us and for the first time there was a vegetarian among us carnivores. Also one of the burger tour virgins didn’t understand our group’s motive and ordered a gyro. Therefore I only took 15.5 results into consideration, even though we were 17 eating attendants. Also Astroburger features unique fold out tables which were noted by several people and were ideal to accommodate all burger tourist on one table, like a big and happy family. 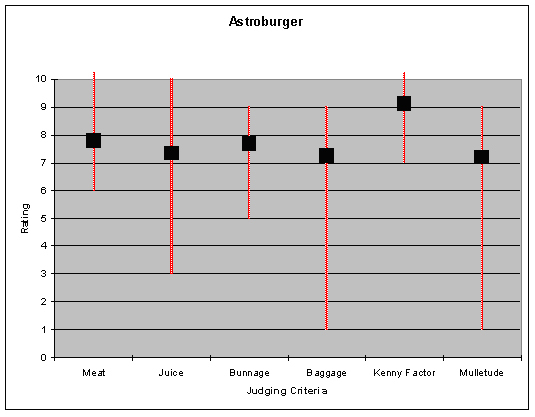 Astroburger is a great place to grab a solid and good burger in a down to earth atmosphere. So make sure you stop by, maybe even for a late night snack after visiting the bars in Hollywood, because Astroburger stays open till midnight and on Friday and Saturday even until 1 am. "Avocado cheeseburger with fried egg rocked my world"
"Why did that guy order a gyro at burger tour?" "A very tasty burger though it was short-order style rather than restaurant style"